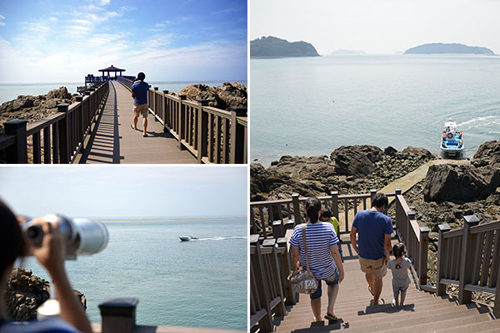 Desert islets that almost magically grow out of the sea are few and far between, but a day trip to Daeijak Island near Incheon affords precious access to one, as well as superb views of the surrounding sea from its various peaks. 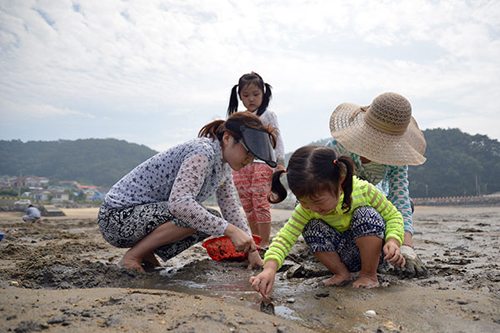 It takes about two hours to reach Daeijak from ferry terminals in either Incheon or nearby Daebu Island. 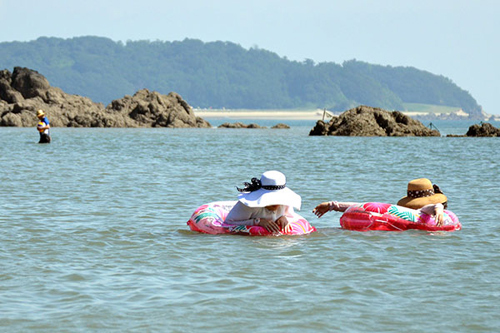 Upon arrival, visitors are advised to check the time of the tides and head straight to the southwest of the island so they are within view of Puldeung islet -- a huge sandbar that comes into view at low tide, measuring 5 km by 1 km. As most ferries reach Daeijak when the tide is ebbing, this should be considered the first sightseeing stop of any tour here. For the best views of Puldeung, head to the middle of Daeijak and look for the totem pole near its main intersection. Once here, turn right to Jageunpulan Beach. Tickets to enter the islet can be purchased here, with ferries leaving regularly from its wooden promenade. 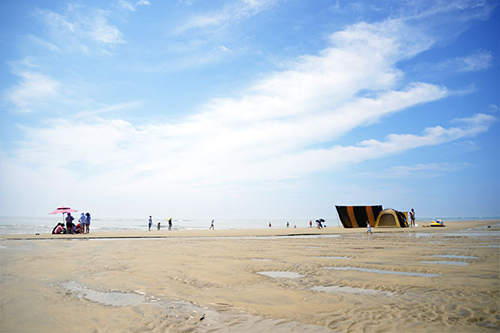 It is only a short journey to Puldeung, which, due to the blazing sun at this time of year, makes visitors feel as though they have arrived in the middle of a desert encircled by the sea. As the islet is fully submerged once a day, it retains its pristine nature. Visitors can soak up the scenery for a maximum of three hours before taking the boat trip back to the larger island. Jageunpulan Beach also has its fair share of attractions. This small but popular spot commands great views and offer plenty of amenities and accommodations. Most of the beaches on the island have gentle slopes and fine sand, making them safe for kids to play on and enjoy water activities there. Camping sites with restrooms and clear drinking water are also available in its pine forest that opens onto several beaches. One of the island's highest slopes, Mt. 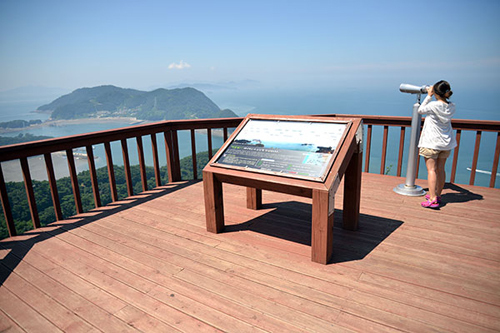 Bua, contains a park with an octagonal pavilion and an observatory granting panoramic views of neighboring islands such as Soijakdo and Seungbongdo. Daeijak is also a decent destination for climbing enthusiasts. Some people arrive here in the morning and climb Mt. Bua (159 m) and Mt. Songi (188.5 m) before heading home in the afternoon. It takes just three or four hours to walk along the gentle mountain ridges. Those who prefer exploring every nook and cranny of the island can bring their own tents and stay overnight, giving them more time to sunbathe, fish, barbecue or drink with friends in a picturesque setting for some unforgettable memories. Visitors are advised to bring their own equipment and food and beverages as prices are higher than on the mainland. But daily necessities, sodas and alcohol beverages can be purchases easily at kiosks on the pier and beaches. There is no public transportation on the island, but those who reserve rooms or other accommodation facilities can enjoy private pickup services. Ferry tickets to the island can be booked online at http://island.haewoon.co.kr.